It’s no secret that modern fashion has a serious infatuation with all things tribal themed. From ikat patterns and intricate beaded details to trendy takes on the moccasin and much, much more – it’s pretty clear that the modern “warrior princess” look is still very much alive and shows no signs of stopping. In fact, some of our favorite jewelry and accessories designers are going even more literal with the tribal trend this season, thanks to arrowhead jewelry. House of Harlow 1960, Pamela Love and more – summer’s obsession with tough-girl-chic details reaches a high point with these jewelry pieces that manage to be rough-around-the-edges in a totally cool way. Consider swapping your bling in favor of these tribal-inspired jewelry pieces – shop some of my favorites in the links below! 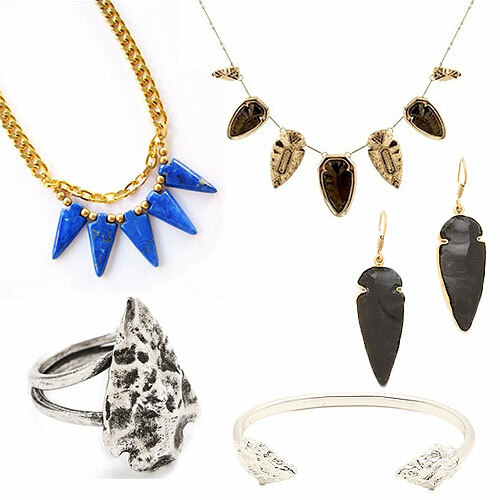 Pictured above: K Amato Arrowhead Necklace, House of Harlow 1960 Multi Arrowhead Necklace, Pamela Love Mini Arrowhead Ring, Fashionology Arrowhead Bangle in Silver, and Charles Albert Obsidian Arrowhead Earrings.